Cappuccino, Latte, Mocha, Hot Chocolate, a cup of Tea? Whatever gets you going in the morning, bring along a friend and enjoy our great offer of 2 hot drinks for the price of one. Offer is available Monday to Saturday from 10am to 12pm. And why not tuck into some yummy homemade cake to go with it? Go on, you deserve it! 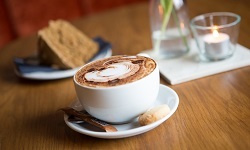 External Website: More details about The Exmouth Arms and 2 for 1 on Hot Drinks – Now on Saturday morning too!